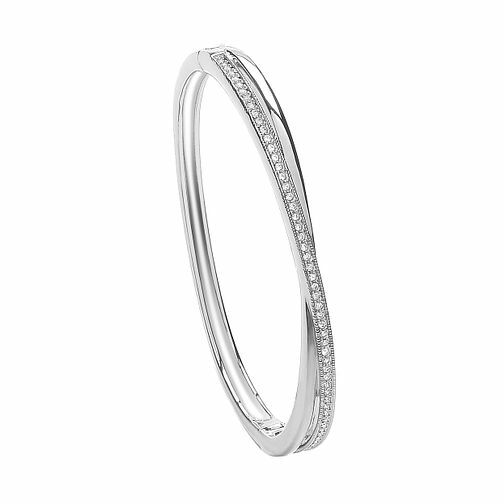 Add a touch of feminine sophistication with this delicate bangle from Buckley London. Featuring a crossover design embellished with Austrian crystals, this bangle is rhodium plated for extra sparkle and finished with milgrain edging for a vintage feel. The perfect way to add a little luxury to your look. Buckley London Crossover Crystal Bangle is rated 5.0 out of 5 by 2. Rated 5 out of 5 by Anonymous from Beautiful bangle Bought this as a retirement gift and couldn’t be more pleased with it. Really sparkly and comes in a lovely gift box. Rated 5 out of 5 by Anonymous from Looks more expensive than it cost The bracelet arrived in a lovely presentation box. It’s absolutely gorgeous and looks far more expensive than it cost. I like that is has a push button clasp so the fastener is very discrete - no safety catch, but it seems to close securely. The sizing of the bracelet is nice for me as not too big, but the best thing is that it is an oval shape so sits very nicely just below the wrist. I am absolutely over the moon with this purchase.